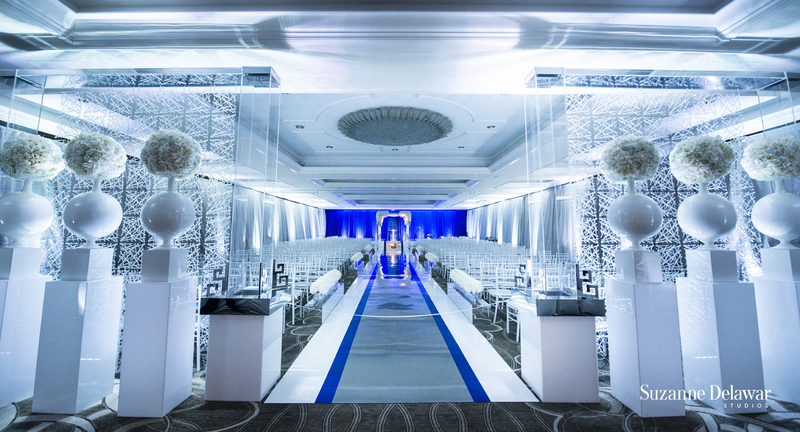 For this luxury wedding, Jose Graterol, the finest Wedding Florist in Miami, used shades of blue, silver, white, mirror to transform the ballrooms to an incredible dream wedding. From the custom designed Chuppah to the striking mirror runway to a combination of various textures in the aisle treatment and draping, it is easy to see that Jose Graterol Designs is the top choice for Miami Floral and Event Design! The entry arrangements were unique and unbelievable, too! The Reception Ballroom was out-of-this-world! Jose Graterol designed the dance floor and lighting to create a cohesive atmosphere with the backdrop of the band. The custom designed DJ booth was a special detail, too. For the table centerpieces and chairs, Jose combined various textures and designs, so that each angle in the room was exciting and different. Each type of table had unique floral centerpieces, too, from an explosion of suspended orchids to floating calla lilies to hovering roses; each one was awe-inspiring! Every wedding is custom designed for the client, and no two events are alike. The finishes, attention to details, customer service and striking lighting, table, ceremony, and dance floor designs place Jose Graterol Designs in the top of the event industry. Look at these photographs from https://www.suzannedelawar.com Each one is more stunning than the next!